As I get older, I'm finding myself a bit obsessed with bath and body care products that use high quality, all natural ingredients. Like Aster + Bay, based in Atlanta and founded by husband and wife team, Erin and Glen Hammond. As stated on their site, "We believe in the healing energy found in nature, in the ritual of self-care and in the mind-body connection possible through botanical scent. Essential knowledge lives on in the apothecary traditions of Europe, Native American herbal medicine, English kitchen gardens and the lore of old Appalachia." Erin and Glen craft small batch, hand-blended infusions and oil blends with organic and wild-harvest ingredients. Their shop includes an ever expanding line of face serums, body oils, therapy oils, hair products and lip stains. In the market for a good exfoloiator, I think I need to try their Dandelion Face Grains made with clays, resins, roots, flowers and grains. You can mix the grains with six different options, depending on the need. For instance, mix with water to detoxify, yogurt to cool and calm or whole milk to nourish and hydrate. Each formula is rooted in history, experimentation and an intention to nourish and treat skin naturally. It's fun to read about each product on their site with highly beneficial ingredients like sea kelp extract, hazelnut oil, Moroccan lava clay, sweet fennel essential oil, tumeric or marshmallow root powder to name a few. Beet root + hibiscus lip stain just sounds so tempting and lovely, doesn't it? I like how their stellar packaging matches the quality of their ingredients. 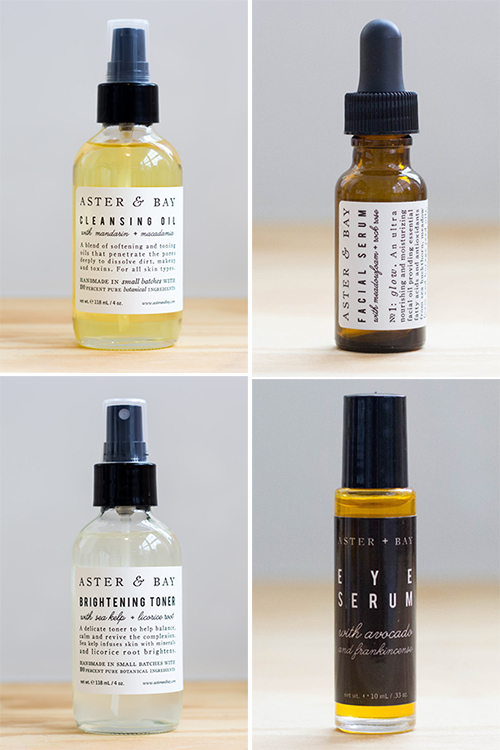 Treat yourself to Aster + Bay products sold in seven states or through the online site, here.